Web Design Home Building Contractors Hampton Roads | Here is another outstanding home builders company website design by VISIONEFX. Our branded, SEO ready, Custom Word Press websites will become the most important digital asset you will ever own. Your website is live 24/7 working for you. Your site is a powerful marketing tool to grow your customer base. We map out a strategy to drive visitors to your new site and convert those visitors into online inquiries and phone calls. When it comes to website design for builders our design team web design to a whole new level of excellence. 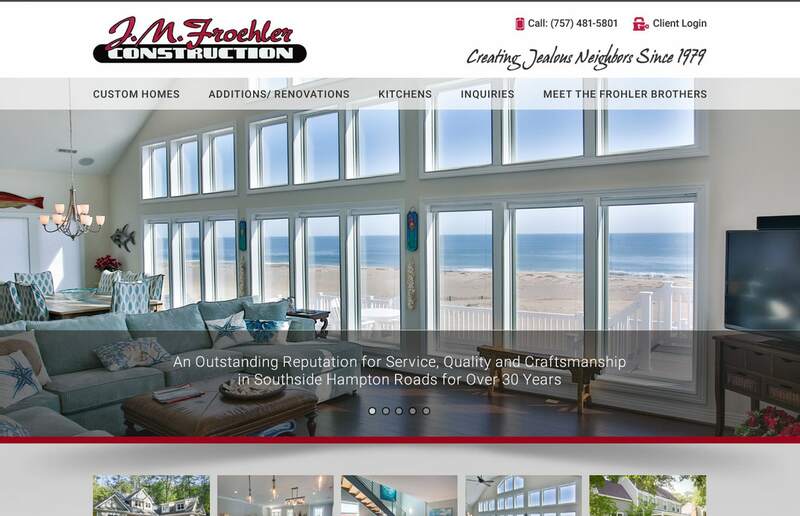 This recent web design construction, general contractors project for JM Froehler Construction provides a competitive branded website presence in a highly competitive space. Click the ‘View Our Design Process‘ link below and browse the creative concepts we develop before building you that perfect website design that is tailored to your business brand. VISIONEFX has great Google Reviews from verified customers posted on ‘Google My Business pages’. We invite you to read our reviews and contact our website customers. They will tell you our web design and web maintenance services are second to none. For great branded website design for your building or contracting business builders call the website design experts at 757-963-1787 or use our online contact form here.